This movie was directed by Mr. Yamakawa in 2004. The story was about the Mayor of Tokyo announced that he would build a nuclear power station in Tokyo. That saying made even apathetic people open up their eyes and try to develop non-nuclear energy power with national budget. There were people casting doubt on such nuclear power and opposed to this issue since 40 years ago. How unconcerned I was about this issue until March 11, 2011. This movie is like throwing a stone at me. Today is to celebrate opening of river in Yanagibashi Gallery. 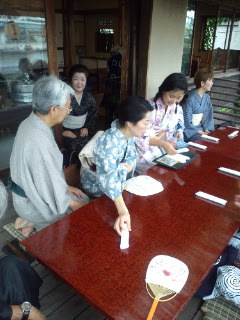 Everybody wore Yukata and walked to Seki Kobo. Then movie started in 2nd floor. Tonight’s movie is about Tokyo nuclear power station.